White's 1844 Directory of the County of Suffolk will tell you that Martlesham is a village near Woodbridge. But the landscape has changed, and now Martlesham is part of the ribbon of development between Ipswich and that pretty market town. A century ago, it would have been a considerable journey through remote countryside to reach St Mary, but today you leave Ipswich on the Woodbridge Road up through the heartland of the 19th century landscape, and after passing the new hospital, you reach the suburb of Rushmere St Andrew, with its trim bungalows, and then busy Kesgrave, east Suffolk's largest modern housing development. Occasional fields can now be glimpsed, but the underpasses and housing estates spoil any illusion of rural idyll. You reach the A12 and the massive park-and-ride, and then across into Martlesham itself. 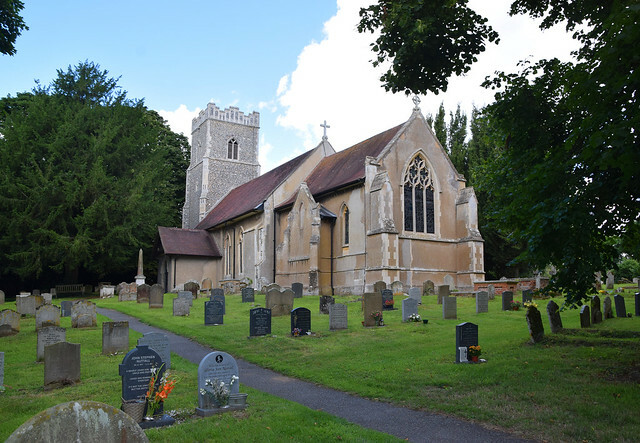 Nowadays, a bypass carries the thundering traffic ever northwards through rolling meadows, and past Seckford Hall, but if you are seeking the church you carry on along the old road. Eventually, you reach the Red Lion, once a staging post for the coaches between London and Yarmouth. Here, some seven miles from the centre of Ipswich, it appears that you finally reach open countryside. But it is an illusion, for you are now only a mile or so from the centre of Woodbridge. Instead, climb steep School Lane, and then head north on another tiny lane that skirts a wild bluebell wood, pleased and surprised by the absence of traffic and its attendant noise. Cycling this way in the summer of 2017 I was reminded of previous rides through this woodland, of two pairs of jays, each noisily busy in a copse about their nests, of a barn owl, of the dart of a green woodpecker swerving along the narrow lane ahead of me. After after half a mile or so, I came to a cluster of old buildings; a farmhouse, a former Rectory, and pretty St Mary, settled in its pleasant graveyard. What the trees hide from you is that you are now on a bluff overlooking Martlesham Creek on the wide River Deben. But there is a sense of the water's presence, in the way that a river swallows sound. Given its setting, this must be an ancient settlement, like Iken to the north. 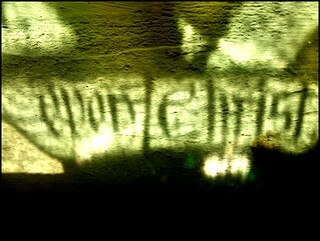 At one time, this church was a beacon on a bluff above the river estuary, welcoming home Saxon traders. Nothing remains of that early church, of course, and now this is a typical east Suffolk rural church without aisles or clerestories. Pevsner thought that the late 15th Century tower was probably by the same mason as that of Helmingham on the other side of Woodbridge. 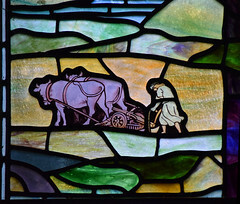 St Mary is home to one of the county's largest collections of Arts and Crafts glass, a complete nave scheme of 1903 by the Manchester-based artist and architect Walter Pearce, depicting a selection of parables. 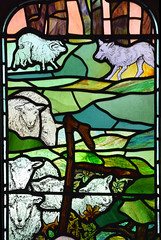 Six years later, Heaton, Butler & Bayne came along and completed the chancel in a complementary style. 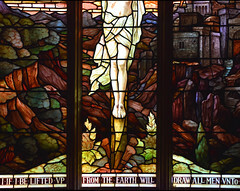 It is all a matter of taste I suppose, although it would be difficult to deny the impact of the east window, a crucifixion set in a desolate world of rocks and thickets, the sky boiling to a murderous red behind the city of Jerusalem beyond. Like its near neighbour Brightwell, Martlesham has a proud collection of hatchments. There are six here, one of the biggest groups in the country, and they are mostly for members of the Goodwin family. One of them is exceptionally early, dating back to the 1660s. Contemporary with the oldest hatchment is the Charles II coat of arms above the south door. 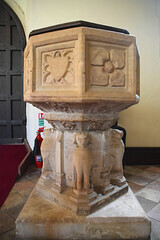 The Jacobean pulpit is dated 1614, but the real survivals of this church are both medieval. On the north wall are the substantial remains of a St Christopher wall painting, the Christ child's halo still bearing gilt. The little votive niche beneath might be original. Before the Reformation, the Faithful could offer a prayer here at the start of the day, calling for protection on their activities during the day ahead. 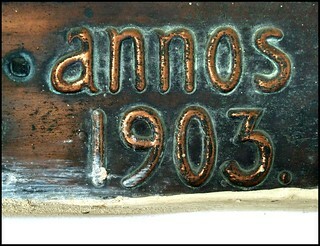 It was uncovered in 1902, and has recently been restored. 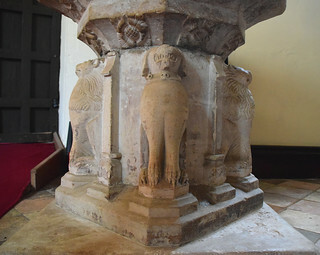 The 15th Century font is also of interest, not least because of two of the beasts that take the place of the more usual East Anglian lions. One is a dog, with a little collar of bells. The bear to the rear of him seems to be wearing a medieval cope. A curious structure sits to the south side of the chancel, looking like some kind of baker's oven. From the outside you might wonder at some mysterious medieval liturgical purpose, but in fact, this chancel was an extension of 1835, and it was probably designed to accomodate the Rector's pew. At the east end of the chancel are huge buttresses, presumably designed to stop the church flowing down the hill into the Deben. Back outside, I found a centenarian's gravestone, and, at last, a view of the estuary from the edge of the churchyard.